Pros: this puppy runs cool. 23 idle, 29 load stock. clocked it to 300*7 with 3:2 divider and temps are 28/35 @ 1.35v. wow. Cons: excuse me? what cons? huh? Other Thoughts: this chip when clocked at 2.1ghz simply crushes my stock venice 3k+. with the mobo it was priced about the same as my venice. got the combo biostar 6100. truly awesome, value or not. both highly recommended. Pros: man this puppy kicks.Ive had this chip for about 15 months now and i dont think ill need another cpu for a couple years.I have it oced to 2.45ghz with stock heatsink/fan and it never gets above 45c, it idles near 32.i have it running in a vnf-250 mobo, and i havent found a problem yet. Cons: man as i said b4, why is there required cons? heres one, Where Is FEDEX!!!!!!!!!!!! Other Thoughts: According to sisoft Sandra This CPU is in par with a athlon fx 53 in all benchmarks, thats simply amazing.Enough Said. Pros: Good CPU, certainly not top of the line but for general computer work, its fine. Neended a CPU for presentations...this was just wat I needed, fast enough but low priced, good beginners unit.Runs at low temp that makes it excellent for small computer cases. Other Thoughts: just a bit slow but for the price, I'm not complaining! Pros: Runs very cool. Overclocks great with stock cooling. Great price. Other Thoughts: I wish Newegg would switch back to Fedex. UPS is inferior in every way. Orders used to take 1 day to get to me 90% of the time, once in a while 2 days. Now 3 or 4 days is standard and half the time UPS won't leave your package if you're not in and you can't go pick it up from them same day if they do that where you can with Fedex (who'll leave it anyhow if you sign their waiver form one time). Pros: Runs very cool (under normal use 22-27C, never gotten it above 30), stock fan works fine, powers my 1TB linux server providing gigabit file service to 3 other computers with power to spare. Cons: stock fan isn't the quietest, but i set my mobo bios to control fan speed and now it's really not bad even in a silent environment. Other Thoughts: haven't bothered overclocking, but i don't doubt that the stock fan can handle quite a bit. if in the future i feel i need more power, i can always step it up to ~2ghz, nice to know. Pros: What isn't good about it? 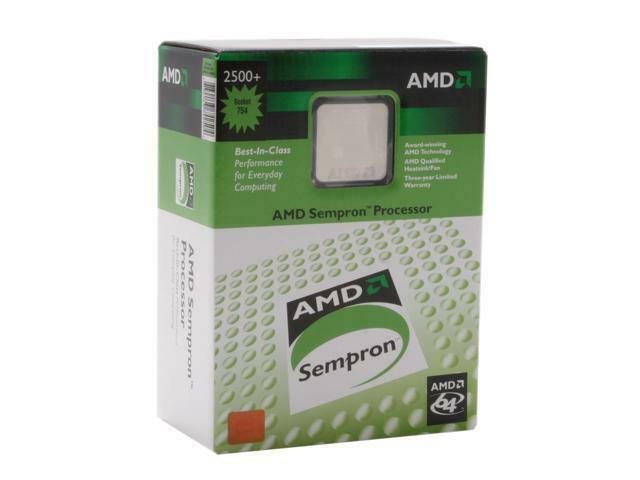 It is a 64-bit processor, runs blindingly fast, it's an AMD, it's cheap. Runs anything that you throw at it. It comes with a great heatsink/fan that keeps it running nice and cool. Cons: Why does this area exist for an AMD product? Other Thoughts: I haven't yet gotten this CPU to run at hotter than 34C running NFS:MW at highest settings. You can't go wrong. I got this for a budget build, and I doubt I'll have to upgrade for a while.